Bill Wimsatt mentioned to me lately in an e-mail that Leigh Van Valen had died in the fall which I hadn’t known. By coincidence, in sorting through some old papers the next day with the aim of disposing of some of them, I came across a copy of Van Valen’s paper on “Three paradigms of evolution” from his journal (Evolutionary Theory 9:1-17, July 1989). I knew immediately why I had held onto this paper for so long – because it contained a mention of his previously published definition that “evolution is the control of development by ecology” which had struck me forcefully at the time and which I had always remembered. Before I published it in a couple of articles, Leigh was kind enough to tell me by e-mail that “I agree generally although not in detail.” I wish now I had quizzed him more and thereby perhaps have learned something else! 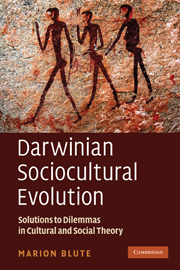 The following is the rationale I eventually provided for the definition ( in Darwinian Sociocultural Evolution, 2010, 166-8 minus references). Natural selection is widely thought of as a sieve, filter or sorting device. For example, Dawkins writes “Each generation is a filter, a sieve: good genes tend to fall though the sieve into the next generation; bad genes tend to end up in bodies that die young or without reproducing” (1995:3). The origin of this metaphor is unknown to me but it is obviously intimately related to the genetical theory of evolution which defines evolution as “a change in gene frequencies in a population” (see any text in population genetics). It has been widely observed that this definition includes genetics and evolution but omits development and ecology. Once these latter are also brought into the picture, it is obvious that the “sieve” metaphor is so simplified that it is positively misleading (what follows in this section is adapted from Blute 2007, 2008a). Natural selection never acts solely “backwards” as a sieve, filter or sorting device. Instead it always acts sooner or later inductively in a “forward” direction, altering the development of individuals. There are two fundamentally distinguishable pathways. First, an ecological change can induce some individual(s) of a pre-existing hereditary background to develop differently whether morphologically, physiologically or behaviorally relative to others. This is possible because phenotypes are plastic (Pigliucci 2001). This in turn can change relative fitnesses, and hence ultimately the frequencies of genetic or other hereditary elements in a population. If a new food source becomes available and is made good use of by some which are heritably different than others, the former are not just chosen; but changed. They may be induced by their altered nutritional status to grow bigger, live longer or produce more offspring for example. Similarly, a new antagonist like a parasite or predator does not bloodlessly choose; it too changes. In this pathway, the sequence is ‘eco-devo-evo-geno’. An ecological change induces a developmental change, which causes an evolutionary change (by changing the relative fitnesses of organisms – it is organisms not genes which survive and/or produce offspring), which causes a genetic change (a change in the frequencies of genetic or other hereditary elements in the population). This pathway (minus the ecological and developmental content) was traditionally called a “preadaptation” in evolutionary theory and thought to be relatively uncommon although more recently under rubrics such as “exaptation” and “co-optation” its probable commonness has been emphasized more. The second pathway, instead of beginning with an ecological change against a pre-existing hereditary background, begins with a hereditary change such as a new genetic mutation or recombination against a pre-existing ecological background. A hereditary change leads some individual(s) to develop morphologically, physiologically or behaviourally in such a way relative to others that they perceive, define or construct a pre-existing feature of the ecological environment differently, changing it, thus changing themselves, thus changing relative fitnesses, and hence ultimately the frequencies of genetic or other hereditary elements. If a new hereditary element becomes available enabling its carriers to consume and make good use of a previously unutilized resource, the ecological environment is changed. That change in turn again does not simply sieve, filter, or sort but inductively alters the affected organism(s) improving their nutritional status, resulting ultimately in a change in gene frequencies. The sequence here then is ‘geno-eco-devo-evo-geno’ i.e. a genetic or other hereditary change is then followed by the same eco-devo-evo-geno change sequence as previously. This second pathway implies that niche construction, (Blute 1995, Odling-Smee et. al. 1996, 2003 but in substance see also Hansell 1984, 2000) is not a once-in-awhile phenomenon. Instead, it is the pathway through which all evolutionary change initiated genetically is achieved.